P. Selz, Sam Francis, New York, 1982, pp. 37 and 164, fig. 87 (illustrated in the photograph and in color). B. Kerber, Bestände Onnasch, Berlin and Bremen, 1992, p. 35 (illustrated in color). Paris, Galerie Rive Droite, Sam Francis, April-May 1955. Osaka, Kintetsu Department Store, Sam Francis, November 1957. Kunsthalle Bern, Sam Francis, May-July 1960. Kunstverein St. Gallen, Amerikanische Kunst, 1966, p. 11, no. 26 (illustrated). Buffalo, Albright-Knox Art Gallery; Washington, Corcoran Gallery of Art; New York, Whitney Museum of American Art and Dallas, Museum of Fine Arts, Sam Francis, 1947-1972, September 1972-March 1973, p. 62, fig. 31 (illustrated). Bonn, Kunst-und Ausstellungshalle der Bundesrepublik Deutschland; Los Angeles, Museum of Contemporary Art and the Los Angeles County Museum of Art, Sam Francis, February 1993-March 1994, p. 111 (illustrated in color). Paris, Jeu de Paume, Sam Francis: Les années francaises, December 1995-February 1996, p. 102 (illustrated in color, p. 103). Los Angeles, Museum of Contemporary Art and Houston, Menil Collection, Sam Francis: Paintings 1947-1990, March 1999-January 2000, p. 70, pl. 18 (illustrated in color). This work is registered with the Sam Francis Estate as archive number SFP54-18. Sam Francis career spanned approximately 50 years and includes a staggering amount of paintings, drawings and prints, but it is his classic works from the 1950s upon which his reputation rests. But paintings such as Big Orange make the artist's brilliance and importance clear. Major works from Francis's heroic years in the 1950s are icons of Post-War art. Big Orange is among Francis's greatest and one of relative few in private hands. A soldier in the U.S. Army Air Corps, Francis began painting in 1944 as a result of a flying accident which caused him to bed-ridden for months. While convalescing, he met the noted figurative Expressionist painter David Park, professor at the California School of Fine Arts. A forward-thinking school and hotbed of Abstract Expressionist activity, Francis studied there between 1947-1949. The faculty included Richard Diebenkorn, Frank Lobdell and Hassel Smith and their visiting artist program brought Clyfford Still, Mark Rothko and Ad Reinhardt to the school. Although his first art teacher was David Park, his most important example was Matisse with whom he shared a belief in the primacy of color. Francis's delicate touch and paint handling is closest to Philip Guston and dramatically different from the heavy handed and thickly painted works of Pollock and de Kooning, as well as the European artists such as Dubuffet and Fautrier. His use of thinned oil paint enabled Francis to give his work the lightness and transparency of watercolor, an effect being experimented with concurrently by Helen Frankenthaler in New York. Having finished his studies, Francis moved to Paris in 1950, where he would live for the next seven years. These years are marked by a restless experimentation, with exhilarating bursts of creativity that he will sustain throughout the decade. Francis's first paintings in Paris were his White Paintings, so named because of their predominantly ghostly white tones. Big Orange is from the series that immediately follows his breakthrough White Paintings--this second series includes some of the most powerful work ever created by the artist. Big Orange consists a group of fields of differing sizes, each containing softly rounded forms which are sensuously painted. Moving away from the essentially monochromatic White Paintings, Big Orange's contrasting fields provided the artist with numerous possibilities to explore the relationship between color and form, always keeping expression as its goal. In their scale and all-over quality, they are indebted to Abstract Expressionism. His use of biomorphic forms, very much in vogue in America, are derived from the influential late work of Arshile Gorky. Never a dry formalist, Francis was creating abstract narratives in color. Francis felt that color had an expressive life of its own, with each making its own impact and conveying specific emotions. "Color is fire...a firing of the eyes...Color is light on fire" (as quoted in W. Agee, Sam Francis: Paintings 1947-1990, Los Angeles, p. 32). The artist's writing, which includes some poetry, provides insight into his work--"Black is the satanic color from which light emerges, often unexpectedly" (as quoted in P. Selz, Sam Francis, New York, 1982, p. 46). "Color is a series of harmonies everywhere in the universe being divine whole numbers lasting forever adrift in time." (as quoted in P. Hulten, Sam Francis, Stuttgart, 1993, p. 38). Indeed, the painting appears to be triumph of light and color over darkness, with the orange center symbolizing the flame that Francis held so dear. It can also be read as a metaphor for birth, with the orange embryonic cell-like structure in the center presaging a new life. 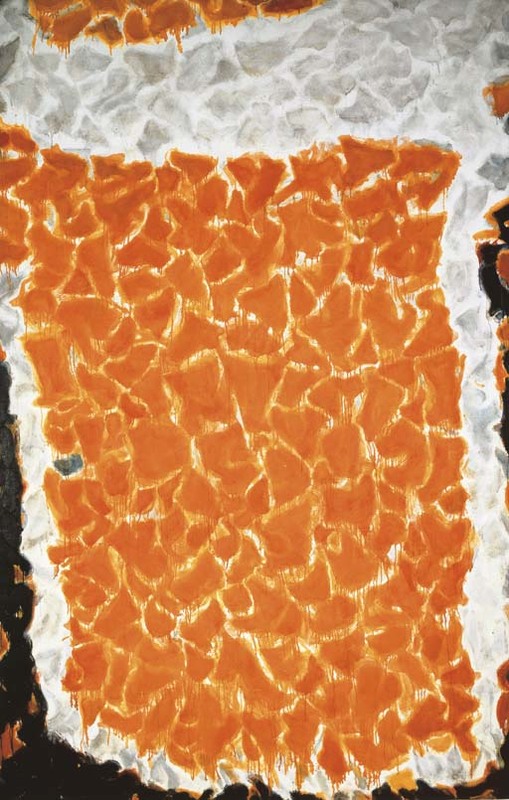 Big Orange and other works from the series were exhibited to great acclaim in Paris at the Galerie Rive Droite in 1955. "Probably the most stimulating show in Paris at present is the one held by a young American, Sam Francis...a dozen large canvases reveal his evolution...smoky, muted at first and evocative of Rothko (P. Schneider, 'Summer Events', Art News, Summer, 1955, p. 74). Time called him "the hottest American painter in Paris" ('New Talent', Time, 16 January 1956, p. 72). Due to the success and acclaim of Big Orange and other paintings of this period, his work was included in numerous exhibitions throughout the world. In 1955, he was part of the important Abstract Expressionist show at the Kunsthalle Bern Tendances Actuelles de l'Ecole de Pairs III which included Pollock, de Kooning and Kline, as well as the Carnegie International exhibition. The MoMA would include Francis in 12 Americans (1956) as well at The New American Painting (1958-59) the international travelling exhibition of Abstract Expressionism that cemented the movement as the driving force in avant-garde painting. MoMA acquired Black in Red in 1955, the first by Francis to enter a public collection. Big Orange was purchased for his father by Dr. Franz Meyer, the important critic, art historian and museum director, and other paintings were acquired by Alberto Giacometti and Henri Matisse. Martha Jackson, who would give Francis his first solo ehixibiton in New York in 1956, wrote a prophetic letter to him in 1954--"So I found a brand new gallery big enough to hold anything you can paint...And what do I think of you? Only that you are one of the great painters of our time" (upublished letter, Martha Jackson to Francis dated 26 August 1954).